Travel Bulletin is the UK's leading travel trade brand delivering news, training, incentives and competitions via our weekly magazine, destination training events and agent focused website. If you have a subscription related enquiry, please complete the form below. For all general enquires, please click here. Would you like to receive: (*) Travel Bulletin weekly printed magazine. Travel Bulletin weekly digital magazine/e-newsletter. 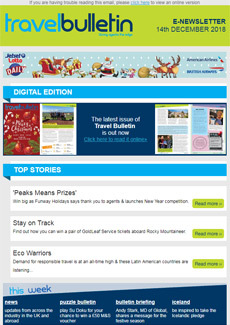 Travel Bulletin e-alerts including news, competitions, incentives, training and event invitations. 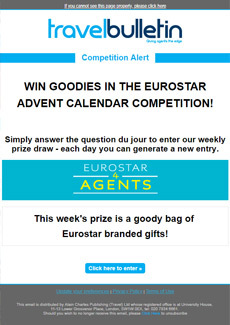 Product news, fam trips, events and offer emails from carefully selected third party travel industry partners.